We’d always wanted to visit La Paz while vacationing in Cabo San Lucas. But, we always seemed to run out of time long before running out of things to do. So on our most recent visit, we made La Paz a priority. Little did we know that getting there would be half the fun. 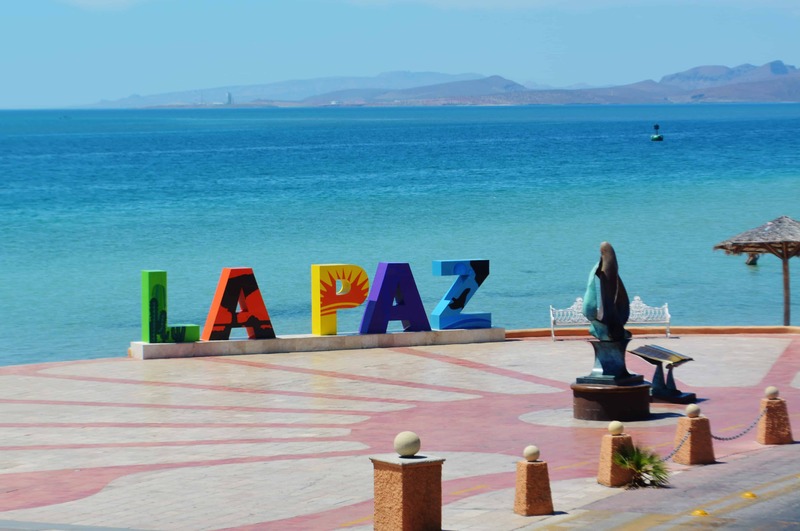 La Paz meaning “The Peace” is located about an hour and a half from Cabo when taking the direct faster western coastal route. But our wonderful tour guide, Vicente with a wink and sparkle in his eye promised us a special trip. 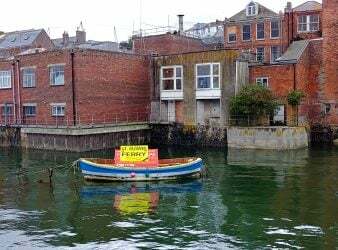 One that would take us to places most visitors don’t know about. 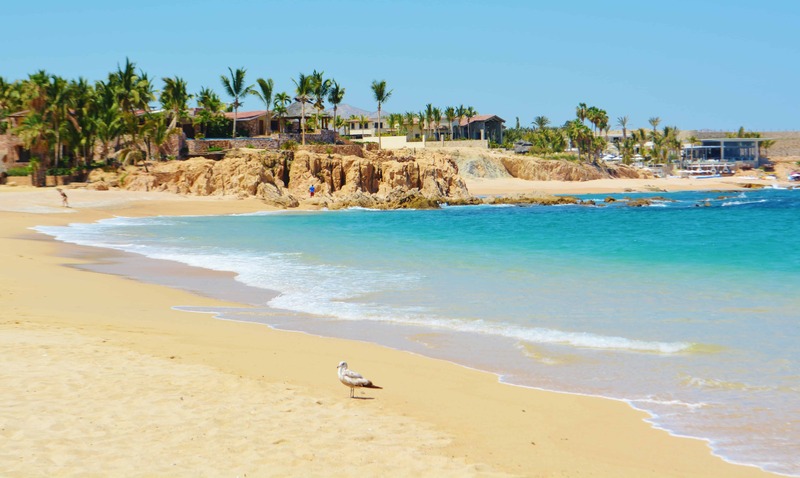 Cabo residents call it “the long way” but it’s definitely worth it. Our first stop was the Tropic of Cancer monument site. Aptly named as it sits right at 23.5° north of the equator. 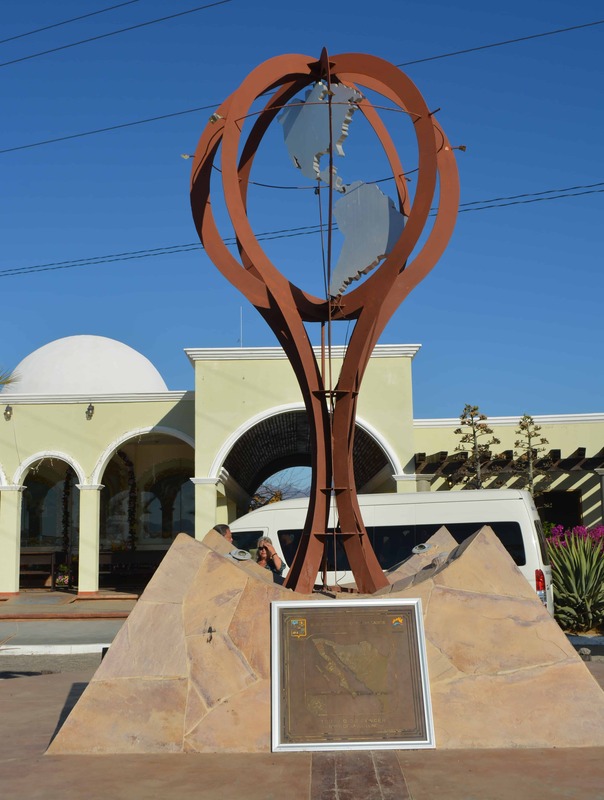 This stretch of Baja Mexico is one of only six world–wide land locations on the Tropic of Cancer, the northernmost of earth’s three most important lines of latitude. Handicrafts and foods made from area farms can be purchased here to support the local community. We’ve all heard the term “oasis in the desert.” But our next pull-off was the first time we’ve ever encountered the real deal. 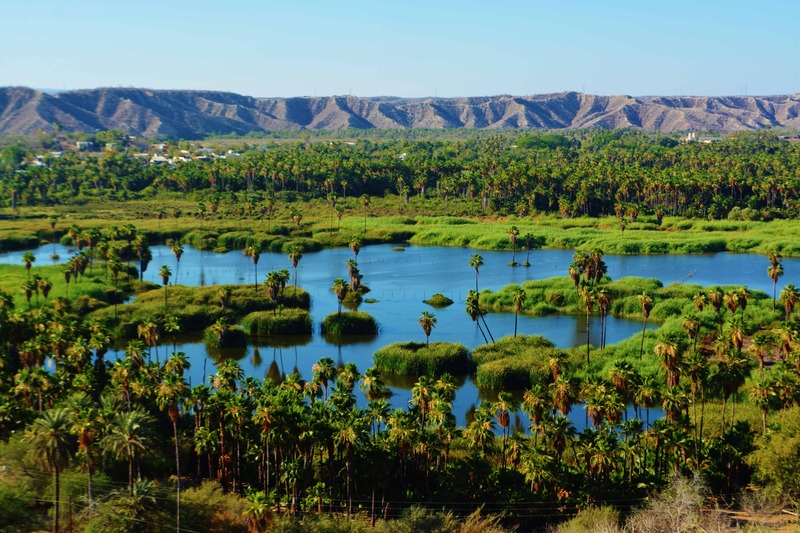 Located just outside the sleepy Baja hamlet of Santiago, this oasis nestled in lush vegetation, appears oddly out of place with the surrounding dry barren Baja desert landscape. Climbing a nearby hill, nothing could have prepared us for the stunning view ahead. Not some small spring-fed pool shaded by a few date palms– this massive marvel was an impressively-sized body of azure water dotted with tree-covered islands and surrounded by a spectacular forest of stately palms. With its abundant green plant life it looked like something out of a Jurassic Park film. We half-expected to see a herd of Apatosaurus stretching their long necks to munch on the bountiful vegetation nurtured by the life-giving waters. Santiago’s magical allure did not end there, for nearby waterfalls and hot springs only 10 minutes from the oasis provided more delightful intrigue to our fascinating journey. Looking at each other, my husband and I agreed that these sites alone were worthy of a day trip from Cabo. 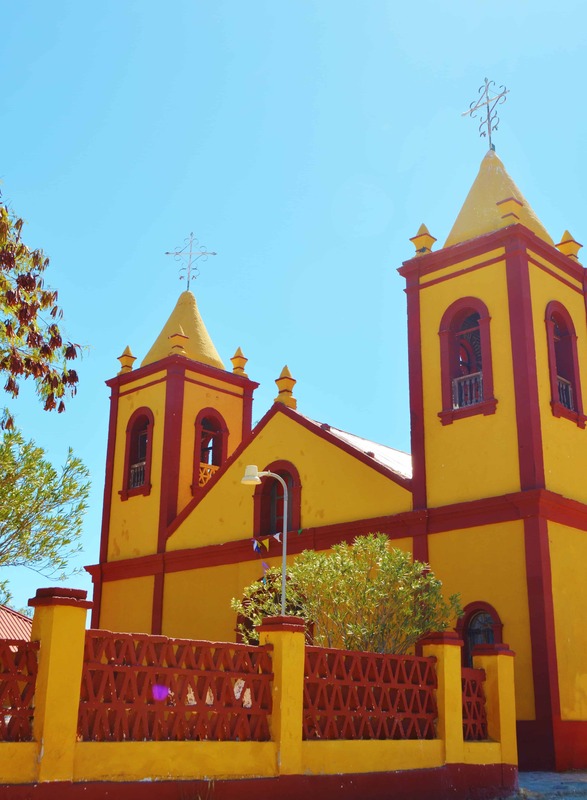 Surrounded by orchards of mango, orange and grapefruit and known for its cheese and agriculture, Santiago hosts a magnificent relic of Baja’s Spanish colonial past – the Mission of Santiago de los Coras Aiñiní. Founded in 1724 by an Italian Jesuit priest, the mission took its name from the Coras, native people of the region. This plain and stately mission added a simple yet timeless sense of serenity to the quiet picturesque village. 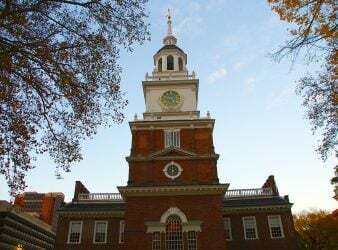 The mission has survived calamities from hurricanes to revolts. Bells ringing from the pink and white mission church beckoned us to enter its welcoming doors. An original mission bell found in a remote corner of the property was displayed in a glass-enclosed case, a testament to its long and storied history. Desert meets the ocean at the Eastern Cape town of Los Barriles – a popular ex-pat retirement community known for its amazing weather, natural beauty, culture and slower pace of life. Conifer-covered mountains provided a refreshingly green backdrop and coastal palms near the sea added a feeling of peacefulness to this seaside paradise. “We’ll likely be the only ones on the beach” said Vicente as we arrived at Los Barriles stunning shores on the Sea of Cortez. He was right. Seabirds foraging in the still clear waters of the lagoon were our only companions. 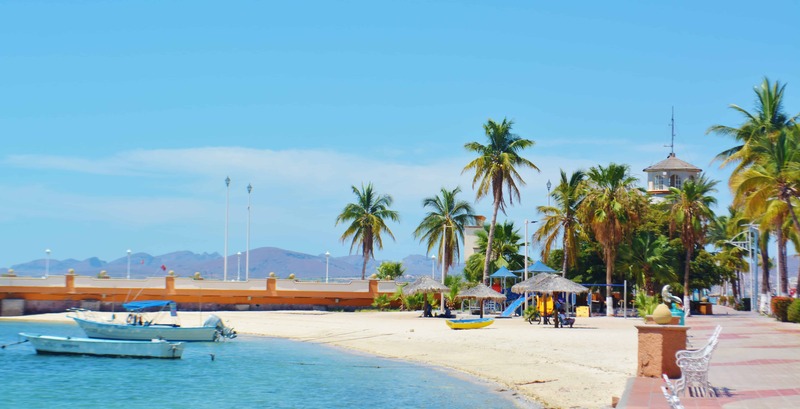 Waters were calm that day but from November through March, Los Barriles is a windsurfer and kite boarder’s dream. 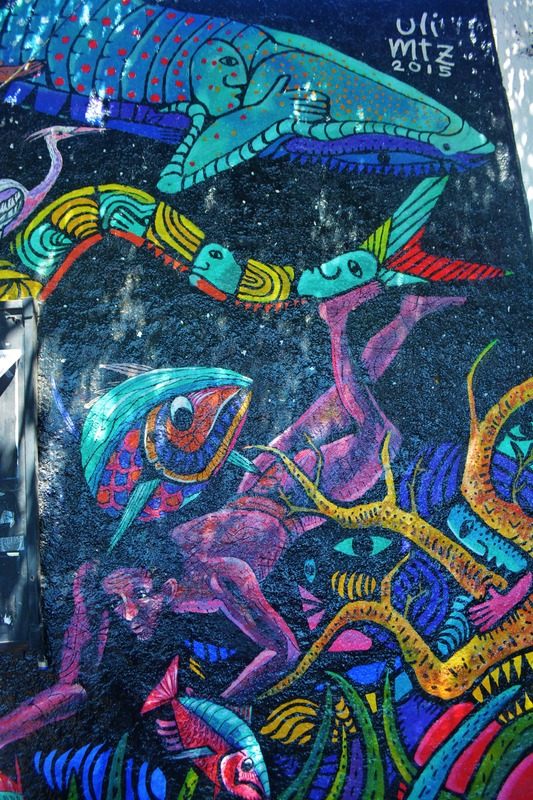 Vincente again pointed out what we quickly came to realize – undiscovered delights abound on the road to La Paz. He noted that the waters in nearby Cabo Pulmo were so abundant with sea life; Jacques Cousteau called these Baja waters the “aquarium of the world.” This remains a prime diving spot even today. The picturesque village of San Bartolo was a perfect refreshment stop. 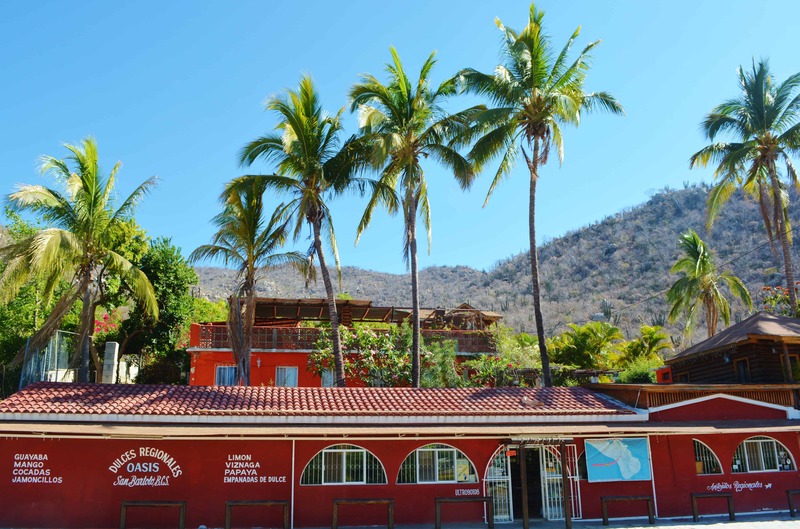 A scenic tropical hamlet, complete with thatched-roof homes, San Bartolo is located just 10 miles north of Los Barriles. Orchards surround the town, making this a great place to buy mangos, avocados and enjoy an incredible local treat- fruit filled empanadas. 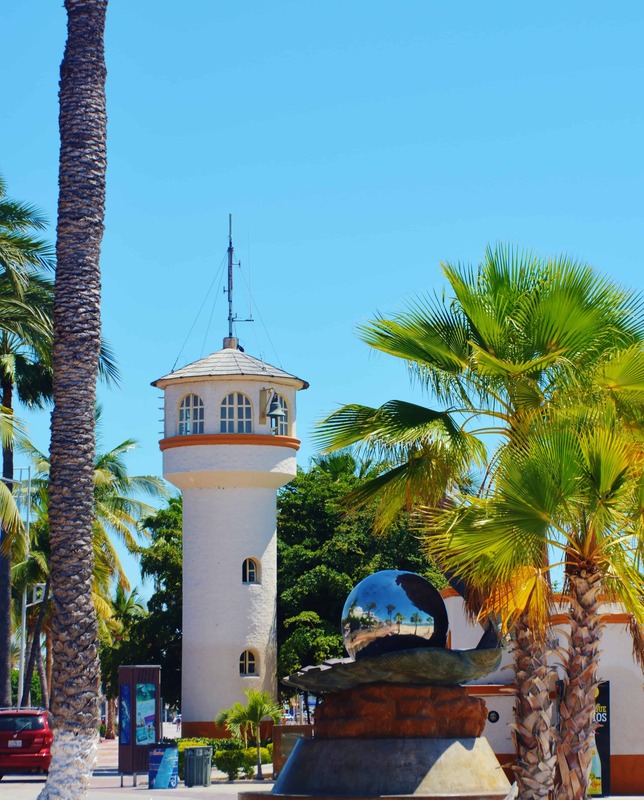 Once the largest city in the Baja peninsula, El Triunfo was at one time a thriving silver mining town. The mines were closed and shuttered in 1926. Now only their smoke stacks remain- a reminder of a more prosperous past before the miners abandoned the area moving to other prospects. Today, a large, colorful rust and gold-painted church built in the late 19th century pays homage to the town’s boomtown past where miners and their families once worshipped. Before we entered the town of La Paz itself we made one last spectacular side trip. 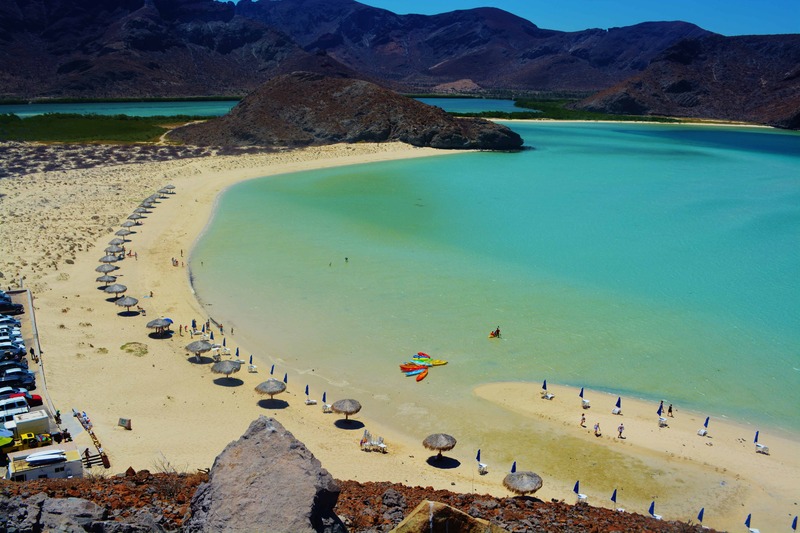 Without a doubt, the most incredibly picturesque and secretive of the Baja peninsula beaches has to be stunning Belandra Bay. While only 20 minutes outside the heart of La Paz, it feels a world away. In a 2016 poll, readers of USA Today voted Belandra the most beautiful beach in Mexico. Surrounded by massive rock formations, Belandra’s waters are pristine, shallow, warm and inviting. Known as the “Laguna de la Colores” its six different colors of blue and turquoise swirls dazzled our eyes. Thatch-roofed palapas lined a spit of sand along the beachline. The calm bay waters are ideal for kayaking. A short but fairly steep hike to the top of a hill provided incredible views of the bay and surrounding mountains. This was breathtaking paradise in its most perfect form. It was lunch time when we finally arrived in La Paz, the capital of Baja, California. We dined at Mariscos El Cayuco located just across from the marina and renowned for their fresh-caught seafood. Marco, the owner greeted us with a smile and warm welcome and seated us on their umbrella-covered outdoor patio. We began with a mouth-watering Ceviche. 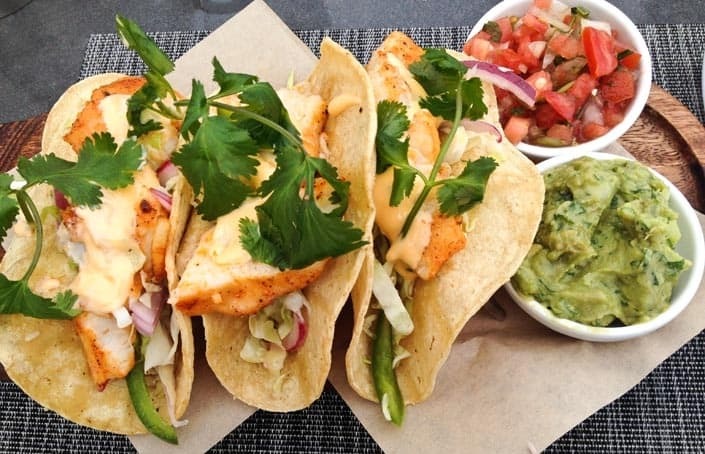 Mariscos’ fish tacos are reputed to be the best in La Paz. Mariscos more than lived up to their reputation here. A strongly fortified margarita on the rocks with a salted rim was the perfect accompaniment. 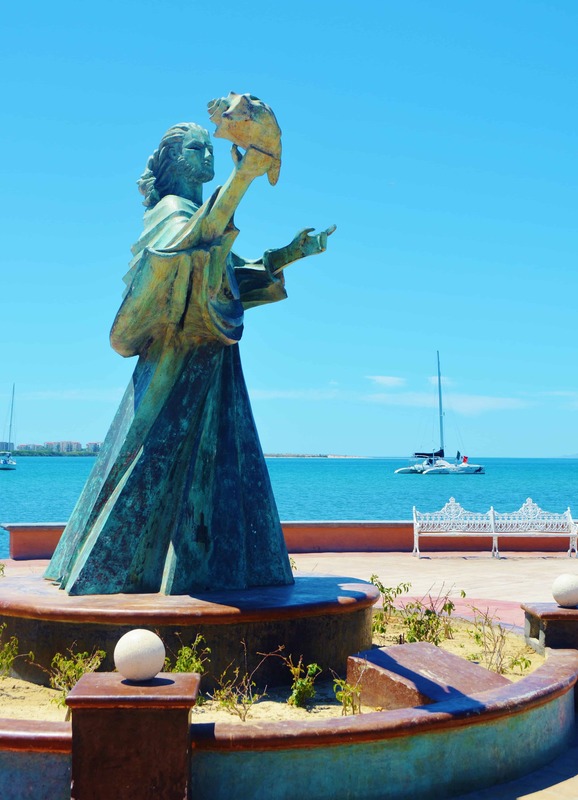 Like other Mexican coastal towns we’ve visited, La Paz has its Malecon, an easily walkable palm-fringed oceanfront promenade on the Sea of Cortez. 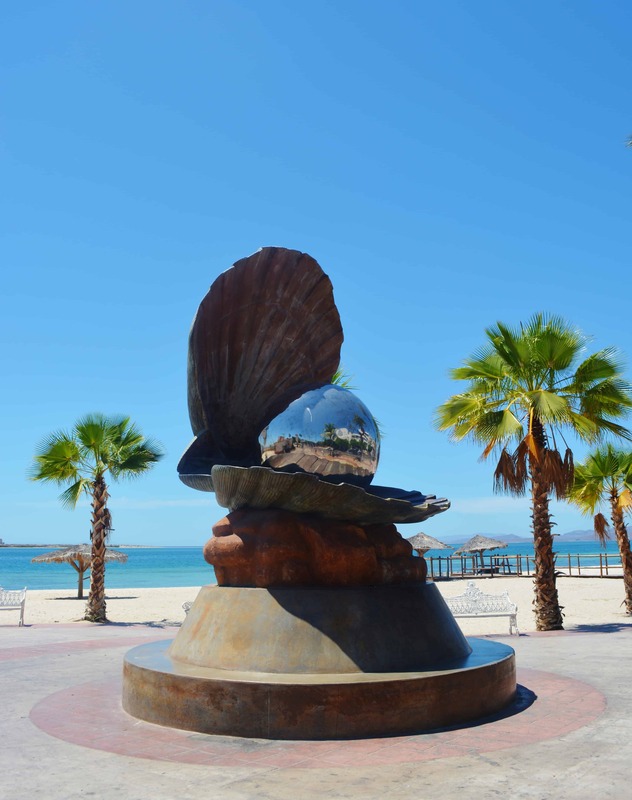 Sixteen sculptures along the way tell the story of La Paz’ abundant fishing heritage and many other gifts from the sea like its treasured pearls. 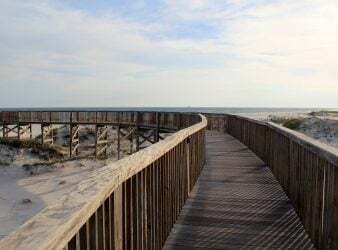 Biking is an ideal way to cover the 3.5 miles of seaside vistas and stop to marvel at its magnificent beaches. A visit to Casa del Artesano (house of artisans) was an amazing treat. We viewed the creative and unique handiwork of local crafters using materials like clay, wood and shells from its desert and coastal waters. La Paz was our destination quest and it more than delivered. To be sure, we’re not finished with this marvelous place. She has museums we need to visit, offshore islands to explore, churches to photograph, and even whale sharks to snorkel alongside. But, it was really the journey itself to La Paz that was the unexpected treasure of our adventure. Looking for restaurants in Cabo San Lucas? Read Noreen’s restaurant reviews on Sunset da Mona Lisa and The Office.